While contemporary medical practice increasingly engages with ethical issues based on a limited range of philosophical principles (notably those developed by Beauchamp and Childress since 1979), little attention is generally paid to the underlying philosophical debates, to the extent that Beauchamp and Childress’ “Principles of Biomedical Ethics” have become known as the “Georgetown Mantra” (after Tom Beauchamp’s academic affiliation), leading an uneasy (often unreflected) coexistence with a case-based (casuistic) approach to ethical reasoning. 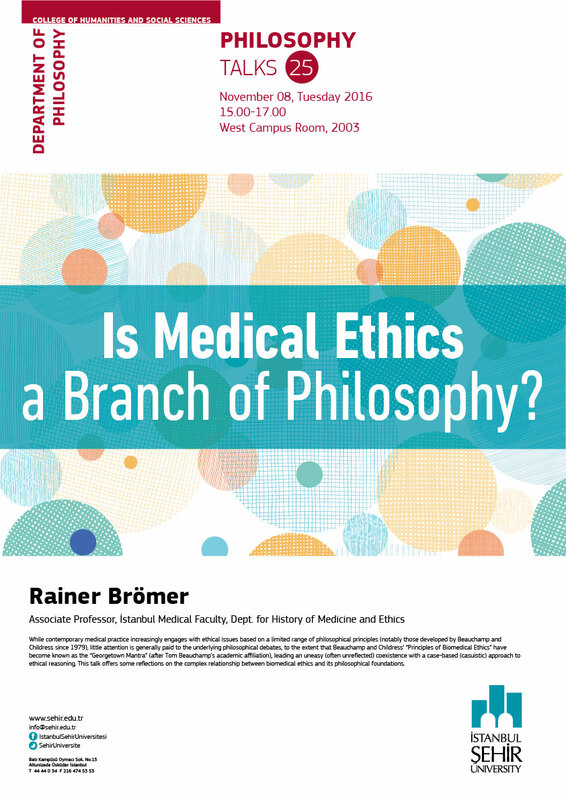 This talk offers some reflections on the complex relationship between biomedical ethics and its philosophical foundations. Sanna Hirvonen (Oxford) will give a talk at Boğaziçi University this Friday (14/10/2016) from 5-7pm in Tb130 on “”The Challenges and Advantages of Contextualism for Predicates of Taste”. Everybody welcome. Abstract: An account of the semantics / pragmatics of predicates of taste must be able to explain two apparently conflicting features: How the truth of judgments of personal taste depend on the taste of the speaker, and how there can still be disagreements of taste. Michael Glanzberg’s  “flexible” contextualist account holds that the context selects an experiencer class. If the experiencer class includes more people than the speaker, then a disagreement of taste may concern e.g. the average taste of the experiencer class. In this paper I show that the contextual mechanisms posited by Glanzberg lead to two kinds of undesirable predictions regarding entirely ordinary judgments of taste: (i) Some judgments of taste get highly unintuitive truth-values that the speaker / hearers are not able to track, and (ii) Some judgments of taste that fail to express propositions, but the speaker / hearers cannot tell when this happens. Frank Zenker (Lund) will give a talk at Boğaziçi University this Thursday (13/10/2016) from 5-7pm in Tb130 on “Can Bayesian models have ‘normative pull’ on human reasoners?”. Everyone welcome. Abstract: Rejecting the claim that human reasoning can approximate generally NP-hard Bayesian models—in the sense that the mind’s actual “computations” come close to, or be like, the inferences that Bayesian models dictate—this paper addresses whether a Bayesian model can have normative pull on human reasoners. For such normative pull to arise, we argue, a well-defined and empirically supported approximation relation is required—but broadly absent—between (i) human reasoning on the ground and (ii) the behavior of a non-NP-hard model. We discuss a responsible stance on this issue. A long abstract can be found here.